You know those cardboard paper tubes you throw away? Stop doing that! Those cardboard tubes can come in handy. 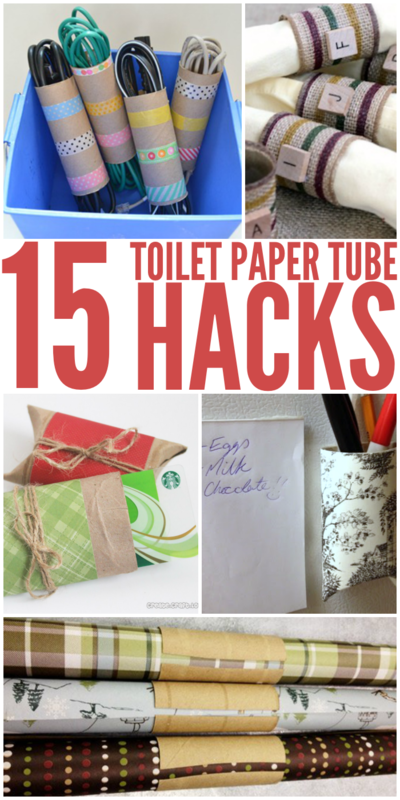 From thrifty packaging for gifts and favors to smart tricks that will help you get organized, here are 15 toilet paper tube hacks you don’t want to miss. Make a pretty pen holder for your refrigerator using scrapbook paper, tape and a magnet. Create pillow boxes for gift cards and small items. Decorate them with scrapbook paper, twine, ribbon, washi tape, or anything else that tickles your fancy! 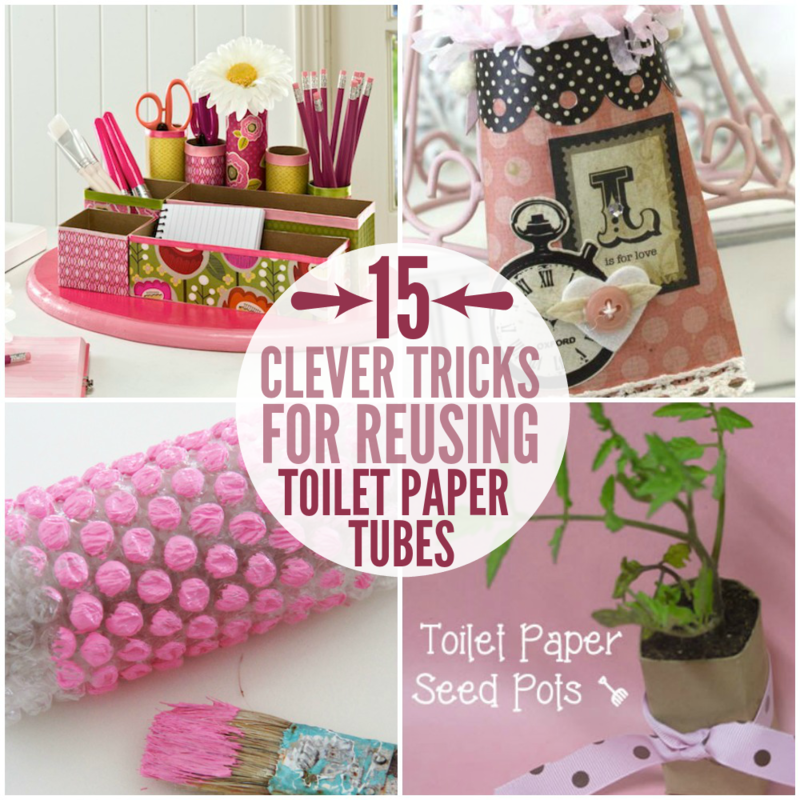 Revamp some toilet paper tubes and cereal boxes to make a fabulous desk organizer. Keep your cords organized and untangled by separting them into toilet paper tubes. Add a decorative touch with washi tape. Dip a toilet paper tube end in paint to stamp out a wall border. Seriously, it works! Start your seeds indoors by planting them in toilet paper tubes. The tubes are biodegradable, so you don’t even have to worry about pulling them out of the tube. Put them straight into the soil. Feed your feathered friends by making a bird feeder out of toilet paper tubes, peanut butter and bird seed. Going camping soon? Make these fire starters using toilet paper rolls, dryer lint and newspapers. Who knew dryer lint could be useful? Create texture when painting by covering a toilet paper tube with bubble wrap. Apply the paint to the bubble wrap, and roll across the surface for a pretty polka dot look. Keep wrapping paper in place by securing it around the middle with a toilet paper tube. Why didn’t I think of that? Love the look of faux metal wall art? Make some yourself with cardboard tubes, paint and a lot of patience. Store hair clips and elastics on an empty toilet paper tube so you’ll always know where they are. Make your own favor boxes for a wedding or shower using scrapbook paper, toilet paper tubes and lots of frilly embellishments. Display your jewelry with a nifty bracelet and necklace rack made using cardboard tubes from paper towels and toilet paper. With a little creativity, toilet paper tubes make fantastic napkin rings for your dinner parties. Love the addition of the scrabble tiles! 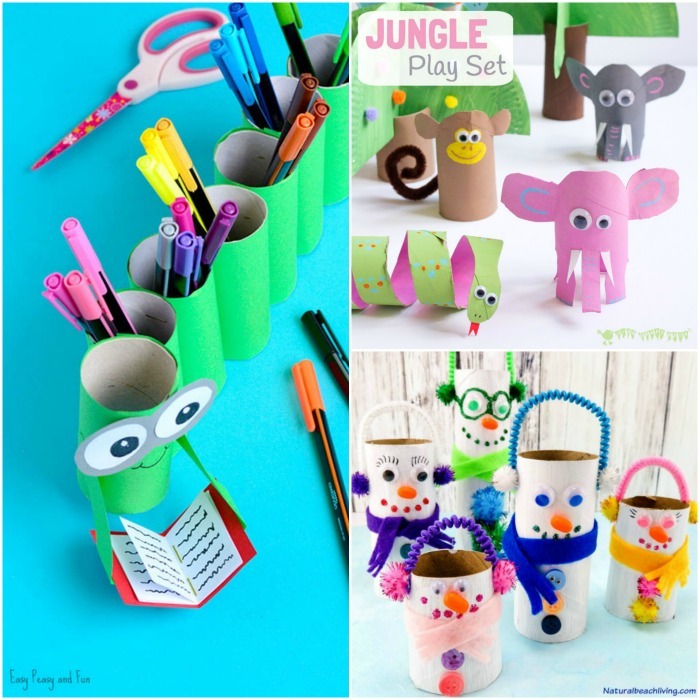 Below are a variety of crafts you can do using toilet paper rolls! While you have a variety of hack options above, let’s not stop there and keep rolling out fun and creative ways to use up toilet paper rolls! Grab your paint, googly eyes, construction paper and let the fun begin! Argh, Matey! It’s a pirate life for me! This pirate toilet paper roll also doubles as a puppet for fun playtime! I am in love with these toilet paper roll flowers, they are so cute and add a pop of color to any room. Great for giving to your child’s grandparents, teacher, or to decorate your own home. I don’t know any kid who wouldn’t love to play with these paper roll fish, they look like so much fun. A little paint and some scissor action and you have a fun little fish you can pretend with. This bee craft is so simple and easy to make, and your kids will love joining in. It is a great craft as they will get more practice at cutting straight lines and more. 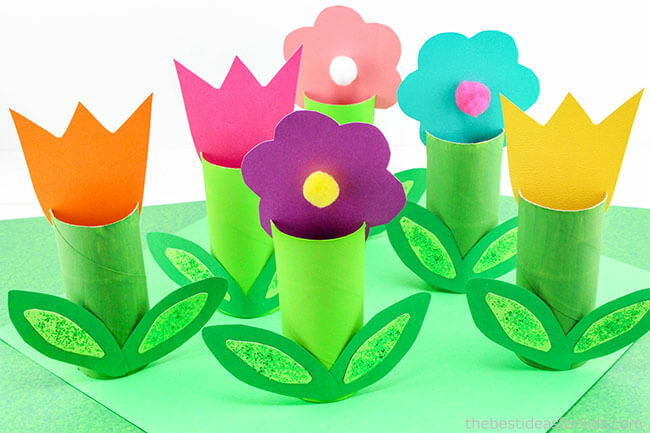 Let your kid’s make their own Easter baskets using old toilet paper rolls. I love the chicken style basket they made, it is super cute. She gives you multiple options to make. 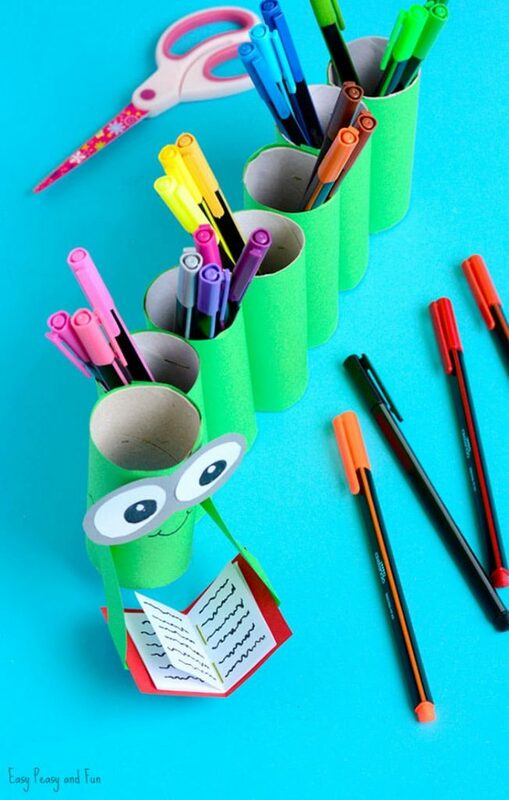 Now, these DIY bookworm pencil holder is absolutely darling. Sit this on your desk where your child does crafts or works on homework for a fun way to dress up the table. If you have a child who loves Minecraft, they might love making these toilet roll creepers. If you are learning about Koala’s let your child have fun creating their own little koala at home. With a toilet paper roll, felt, and a few other supplies you can start crafting the day away. Do you wanna build a snowman? 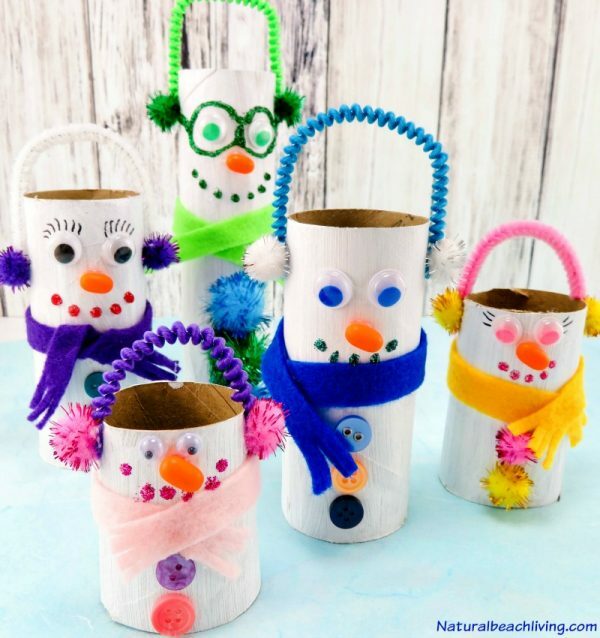 On a cold day stay indoors and make these adorable DIY toilet paper roll snowmen! Gobble Gobble says the turkey! Head outdoors and find some fun leaves to create tail feathers for this easy toilet paper roll turkey. Looking for an under the sea inspired craft? Check out these fun eight-legged octopuses that are made from toilet paper rolls. What kid doesn’t dream of becoming a superhero these days? Create homemade superhero cuffs at home with some supplies and of course, toilet paper rolls. Create these fun ninjas for your kids to play with during playtime! You can get creative with colors and designs and let your child’s imagination run wild. Choo Choo, coming through! 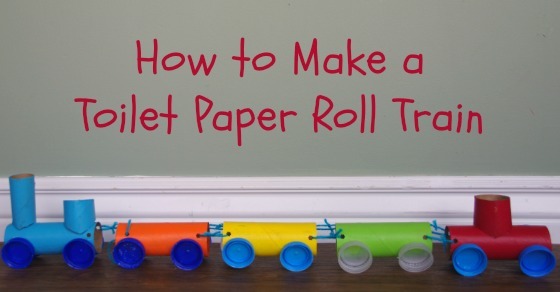 Your child will have a blast making this toilet paper roll train. I love animals and the outdoors. This toilet paper roll fox craft is absolutely precious as can be. A woodland animal that is adorable and would be so cute sitting on a shelf in your child’s room or letting them play and use their imagination. Grab your cupcake liners, toilet paper rolls and get to making these fun owls. I love that your child can color it to fit their personal style, or find colorful cupcake liners and let them mix and match colors and prints. These toilet paper peacocks are just perfect for a rainy day. Stay indoors and have fun creating personalized peacocks of any color of your choice. Grab your craft supplies and just enjoy your time. 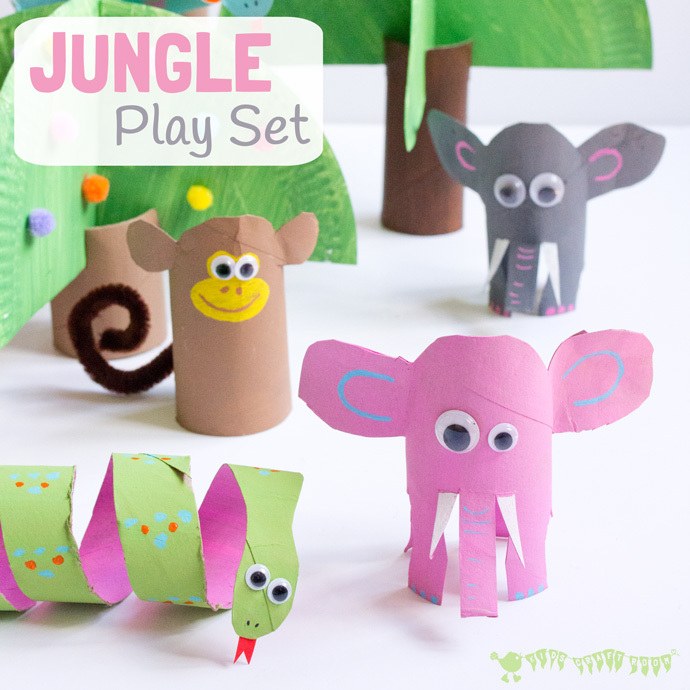 Make a whole jungle theme using toilet papers. Elephants, monkeys and more. A great little play set for your child to play with after they have fun making them. If you loved the movie Finding Dory, you will love this Finding Dory inspired craft. Create Nemo, Dory and more. I saw this and thought it was really fun, it is an Advent wreath. Celebrate the four Sundays before Christmas eve with this wreath that your child would enjoy making.